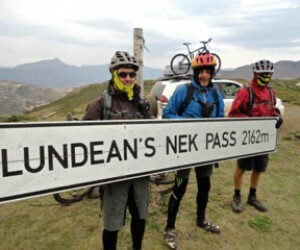 Buoyed by our gains of yesterday, we decided on a creative route with the odd detour or shortcut which would give us a chance of riding past Quiting (the logical stop) and on to Reedsdell which is well into South Africa. Making good time out of Bethel, we were soon in Phamong village where we planned to leave the designated route for a little plunge down into the Senqu valley, where we understood there was a ferry for us to cross the river. Garmin waypoints in place, information from locals at hand, off we went along a very rough trail, which petered out. Seeing a reasonably well-defined trail in the distance, we decided to scramble down the sandstone ledges and make for it, in the hope that the ferry was at its end. When we got to the Senqu, we were on a high cliff above the river, but we could see a boat on the other side of the river. Only problem was that there was no boatman and the 150m wide river was flowing much too strongly to swim for the boat! Snookered we thought! We weighed up our options and decided we had no alternative but to backtrack all the way back up to the road (wasting some two precious hours). Just as we turned to retreat, Danie took one last look at the river and to his surprise, he saw a boat crossing! Great save as this detour then worked to perfection, saving us lots of time! We spent our final hours in Lesotho riding along the Senqu, admiring the sandstone massifs which are characteristic of this area with their lower reaches covered in aloes in full bloom. 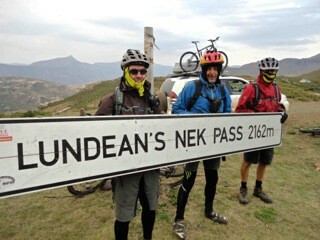 After the border formalities at Telle Bridge (where Donald Woods escaped from SA) we turned east to ride on the SA side of the Telle River, making our way to the iconic Lundean’s Nek Pass. The scenery here is exquisite, being reminiscent of a few of the Western Cape river passes. While it is the international boundary, the little Telle is no major obstacle and by the number of river crossing spots, it is obvious that no-one in the area takes any notice of this. 100km into our ride for the day we reached the foot of Lundean’s, a 12km climb of some 700m. The road and the scenery make this one of the most spectacular passes in SA and as the guys noted, it’s obvious to see why this is part of the Spine route even though it goes east when the Cape is to the west!